Every man needs to know the importance of looking after their beard, which is why we are creating this series of articles on beard care. It's that important, and we care that much about how your beard looks. After all, beards are fashionable right now, and I can say I want it to stay that way as long as possible. But sometimes your facial hair needs a bit of TLC. When this is the case, you're gonna want the best and quickest result possible. If you need a quick fix for your face, you're going to want beard butter. With the best of both beard balms and beard oils, beard butter will moisturize and fix your face fast. First, let's take a look at our favorite beard butters, then we'll move on to what beard butters are and how they work for you. Sounds amazing. But why should I care? I think my beard is okay. Okay, so why would I choose beard butter and not beard balm? What about beard oil? Isn't that more fluid than beard butter? So what exactly does beard butter do for my beard? Sounds great. But how and when am I supposed to use this stuff? So is beard balm a beard conditioner? I've realized this is what I'm missing in my life. So where can I get beard butter? I'm afraid Russian hackers will steal my identity if I buy stuff online. Can I make this at home? I'm sold. But what about the other products? Should I use oils and balms as well? How about a beard brush? Should I get one of those? 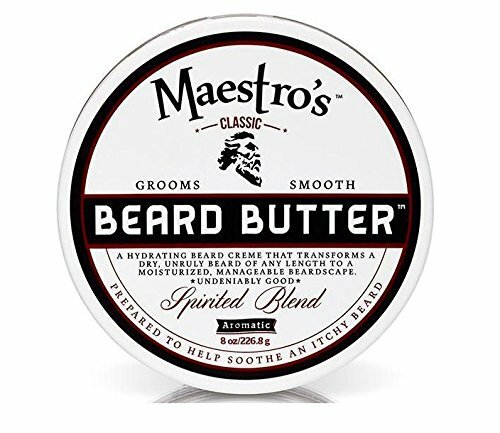 Maestro's beard butter is quite different to other beard butters in that it's not oil based. The benefit of not being oil based is that you get a butter that's incredibly light and is quickly absorbed. This beard butter contains rosemary and eucalyptus which are both fantastic for skin health and hair growth. The shea and cocoa butters contained within this beard butter ensure your beard is deeply moisturized, they lock out dryness and work to prevent beard dandruff. We found that it annihilated any skin issues we had. The amount you get in this tub is insane, you get twice the amount as you'd get with other brands, for us, this really is the best. We love Wild Willie (easy now!) simply because their products are absolute quality. They're all made from a great selection of home grown in the USA ingredients, they're all also organic which, trust us, your beard wants. This is a really thick beard butter but don't let that worry you, it rubs into your beard really well and seems to just melt into the skin, you do need to be careful, as applying too much will oversaturate your skin and the excess will sit on top making your beard and face look greasy. Apart from being fully organic and made with the best ingredients, it also smells amazing! If you're looking for one of the best beard butters out there, then look no further. Like beard oil and beard balm, beard butter is another important product for any man that's looking to maximize his beard growth and keep his facial hair looking and feeling its absolute best. Containing the same set of carrier and essential oils as a good beard oil, beard butter only differs from beard balm in how it's delivered to your face. Beard balms have skin healing and moisturizing butters as the second main ingredient, and generally, have some sort of wax that adds definition and hold. Beard butter only every have the butters. Hence the name; beard butter. Unlike beard balms, beard butters aren't as good for hold or style. What they are good for is conditioning and moisturizing. You can expect a good beard butter to stay in your beard for most of the day, and all that time it's going to be coating your skin and face fuzz in liquid goodness, protecting it from the harshness of daily life, dust, toxins and weather. If you're looking at beard oils and beard balms, and just can't decide, it's like the best of both worlds. You might think that, but there's no real way of knowing. See, you can assume that your beard is healthy, but under the skin it's an entirely different story. There are obvious signs of a sick beard, ranging from brittle hairs that come out in clumps on your pillow, or when you brush it every morning. There's greasy, dirty hairs that stay rank no matter what you do to clean them. Last but not least, there's beardruff. Beard dandruff. Yes, it's as disgusting as it sounds. Unless you somehow like having flakes of dead skin in your beard and all over your shirt? Even if you don't have any obvious problems like these, a mistreated beard can still be in bad condition. Thankfully, your beard is always growing, so even the worst cases can be repaired in a few weeks with a good beard care regime. Here's the thing. If you've never grown a beard before, it's easy to think that your body knows what it's doing. That you can just leave it to grow and everything will be fine. Unfortunately, that's completely wrong. See, under every hair follicle in your skin is a sebaceous gland. This tiny little gland has the wildly important job of producing the oil that keeps your skin moisturized and stops it getting cracked and dry. It's a lack of these oils that causes the dandruff you get in your hair, and if your face gets dry enough, this is what's going to happen to your face. The major problem with beard care is that they need that same oil that your skin needs. But your sebaceous glands can only produce so much oil, and as your beard gets longer it needs more and more oil to keep healthy. So it drinks more and more oil, but your sebaceous glands can only produce so much. So when your beard gets past a certain length, your body literally can't produce enough oil for both your beard and your skin. So your skin starts to get dry. That's why you need to treat your beard properly. If you look after your beard, it will look after you, and that requires a specially designed treatment like beard butter. Beard treatments contain perfectly balanced combinations of oils, vitamins and other essential beard care ingredients that, with regular use, can clear up almost any beard problem you might face. And even if your beard is in tip top health (lucky sod,) using a beard treatment will make your beard even sexier, and stop anything happening to your pride and joy in the future. Good question, with a really simple answer. Beard butter is the absolute best choice for when you have a dry face that needs rapid treatment. If your beard is dry and itchy, especially after a long day. Beard butter.If your skin is flaky, dry, cracked or you've got beardruff. Beard butter. If you naturally need to moisturize and you've just started growing a beard. Beard butter. See the pattern? If you've got any sort of skin complaints and you need the quickest fix possible, then beard butter is generally a great answer. And why is it better than beard balm? Well, it's not really about better. They're both suited for different things. As beard butter is more liquid than a beard balm, it's more easily absorbed into your skin and hair. Because it's easier to absorb, not only does it penetrate deeper into the areas that it's needed, but you can actually put more butter on your face than you would balm without your face looking or feeling shiny or greasy, so you get more effect from each use. If you'd like to learn more about beard balms, you can read our guide. Yeah, it is. But because the carrier oils in a beard oil are effectively raw, they're absorbed almost instantly into your beard and skin. In a beard butter, the oils are held in suspension by the butter itself. This allows your skin to absorb the oil more slowly, delivering a longer lasting effect, as well as letting the mixture itself sit on your skin for longer, meaning it naturally protects your beard for much longer than an oil ever could. In my experience, both beard oils and beard butters are actually great to use together. Because they're both great for beard health but do different things, using beard oils and beard butters in unison is one of the best things you can do for an ailing beard. I've personally known people that recommend using a beard oil every day and a beard butter once or twice a week, as needed, and because of my own experiments I know that my beard responds well to something similar. As we always say here at Major Beard, every man's beard is different, so experimentation is key. If you want to learn more about beard oil, you can read our guide. Good question, young beardawan. After all, what sort of maniac goes and slathers his face with something that he has absolutely no idea about. Beard butters, beard oils and beard balms all have the same set of active ingredients, which are a good carrier oil and a set of essential oils. It's these oils that do the good work of moisturizing and revitalizing your beard. 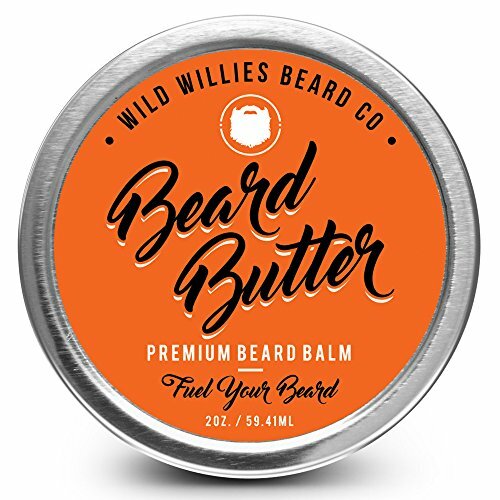 Beard butters also contain a butter (shocking, I know,) that keeps the beard oil locked in and fluid throughout the day, rather than just being instantly absorbed. It's the addition of the butter that makes beard butter work as such an effective moisturiser, which is why it's the single best option for people with really dry skin or parched and cracked beards. The butters most commonly used are either shea butter, cocoa butter, or a mixture of both. Shea butter is widely used in a massive variety of products all over the world for its skin moisturizing, healing and restorative properties. Not only does shea butter keep your skin moisturized, it's also packed with antioxidants and other things you don't care enough about to remember the name of that work as anti-inflammatory and antibacterial agents, keeping your skin clean, clear and healthy. Suffice it to say, shea butter is a fantastic addition to any man's grooming routine, especially if he cares about keeping his skin soft and smooth. Cocoa butter is another naturally occurring butter that's been used worldwide for centuries as a skin moisturizer and healer. It's harvested from the cocoa bean, and it's in every bar of chocolate you grab on your cheat days. Excellent at rehydrating skin tired or damaged from a hard day outside, cocoa butter is used in thousands of women's beauty products just because it works so well. What works for the girls also works for us, and cocoa butter is so good for the skin that you've probably already been using it. It's a component in a lot of more natural shaving creams. Regardless of which butter your beard butter contains, as long as it's one of these two you can stop worrying and move onto the carrier and essential oils. It's the carrier oils that do all of the heavy lifting when it comes to nourishing your beard and helping it to grow, so it's important to make sure that you're picking up a beard butter that has the perfect set of ingredients for what you need. When it comes to carrier oils, there's three that are generally accepted as the best choices. Grapeseed, Jojoba and Sweet Almond. All three oils have been shown in studies to aid in hair growth and hair health, so it doesn't matter too much which one you go for in the long run as they're all going to do a great job, but they are all slightly different, so it's generally worth considering which one might be best for you. Grapeseed oil is made from grapes, and out of the three choices, it's the lightest oil and the least likely to clog the pores, so if you suffer with bad skin or are prone to acne, this is the best choice. Jojoba is the oil that most closely mirrors the oils produced naturally by your skin, so it's by far the least allergenic, meaning you aren't going to get any weird rashes with jojoba. If you're naturally allergic to a lot of things, especially if you're allergic to anything plant based like grass or pollen, spring for a jojoba based oil. Sweet almond is by far the highest in vitamin E and proteins, which are both essential building blocks in hair itself, so sweet almond-based butters are the best for repairing damaged hair and encouraging new hair growth to be as strong as possible. When it comes to essential oils, there's a multitude of options. Almost as many as there are types of beard product. Used mostly for scent, essential oils are less important than the type of carrier oil and butter used, but still worth looking at. As it's an in-depth subject that's a little off topic, we're not going to go too deep into it here, but if you're interested, we've got a great guide on essential oils here. That's great, I hear you saying. So now I know what's in my beard butter. But what does it actually do! You'll be glad to know the benefits are huge and far reaching. First, beard butter treats beardruff, and everything that causes beardruff. I don't know about you, but to me there's nothing worse than putting in hard work trying to achieve something, and realizing that once you've done it, it only brings a whole host of new problems with it. That's the thing with beardruff. Until you've had a beard, it doesn't even cross your mind that this might be a real problem. Then, one day you look down and realize that your suit is spattered with bits of dead, white skin. 'How long has that been there?' You wonder, skin crawling. 'How many other people have seen it? What must they think of me? 'I share your pain. Luckily, the cause of beardruff is real simple. One that we've discussed already. Lack of oils and moisture for your skin because your greedy greedy beard is sucking it all up. Pretty much every ingredient in a beard butter is fantastic for treating dry skin, and taken in combination, it's the single best option for the soul destroying problem of dry, flaky chin skin. So if you're currently suffering from beard dandruff, or you know someone who is, you know what to do. Most people's issues will clear up in just a few days of regular use. Second, beard butter will soften and tame your beard. Now, I don't know if you've got a significant other. (I'm guessing because you've got such a manly looking beard and you're clearly interested in looking after it and yourself the answer is yes, but you never know. You could rock the single life.) But if there's one thing a girl hates, its nestling close to a beard that's got all the consistency and softness of a kitchen scouring pad. I've had beards of all lengths, and what I've noticed is that it's generally fine until you get to a certain length, generally around half an inch, and then everything just starts to get stiff and rough.Luckily for you, (and any potential partners) just applying beard butter every day goes a long way to fixing this problem. The problems caused by dryness, and because beard butter is such a potent moisturizer, a few days of treatment will start to lock moisture deep inside the hairs on your face, leaving them softer and smoother to the touch. As another bonus, not only will your beard look more vibrant, healthy and alive, but it'll be tougher, too. A brittle beard is a fragile beard, and I'm sure every man who has ever brushed his beard has had that panic moment where he finishes up his style, looks down at the brush and damn near turns white at the amount of broken hairs tangled in it. Seriously, until I started using regular beard treatments, my brush looked like I'd just run it through a molting dog. And of course, if your beard hairs are regularly breaking, that leaves your beard shorter and thinner. Who wants that? The best time to use any sort of beard product is after your beard is washed, so for most men, after the morning shower. You're going to want your beard to be damp, not wet, and not bone dry. Start by gathering up one fingertip's worth of beard butter. Spread the butter evenly across both palms. Work the butter into your beard, starting at the bottom of your neck and working up. Once you've done your neck and throat, work inwards from both ears, finishing in the middle of your face. Finish up by using a good beard comb or brush to brush your beard down. This will help to spread the butter evenly throughout your whole beard and make sure it hits every part of your face. Technically, yes. There are specific beard shampoos and conditioners that are designed to use in the shower. They're something entirely different. Luckily for you, we've got a guide all about those. However, because of the way beard butters work, and the fact that their main use is to nourish and condition your beard, it's fair to say that yeah, beard butters are a beard conditioner. Pretty much all good pharmacies and other stockists will have a men's section where you'll be able to get beard related products. However, beard butter is pretty new on the scene so even if your local mall does have beard butter, their stock is going to be limited. The best place to get any beard products is definitely the internet. I prefer Amazon. The selection is bigger than anything else out there, so you'll be able to find the perfect product for you, they deliver straight to your door, and they've started an awesome subscription service where they deliver the products you need at regular intervals. That means as soon as your pot of magic goop starts to look a little low, another will be in your hands without you worrying. ​You're damn right you can. And it's surprisingly easy to do. If you're wondering what ingredients to put in your beard butter, look up at our list of the best carrier oils and butters to use. Start by melting the beeswax. The easiest way is to place it in a glass mug or pot, then stand the container in boiling water. Never expose the beeswax directly to the heat, you'll end up discoloring and burning it. Add your essential oils, a few drops at a time. Don't overdo essential oils! That's it. Because it's such a simple method and formula, it's easy to experiment. The best thing you can do is try out a few varying formula and see how your beard responds. Like we said earlier, you can, and you probably should. Because each product does something different, it's generally a really good idea to use more than one. Now, don't take this as me saying you need to slather your face with beards, balms, and oils every day so you can barely even move your jaw. No, what I'm saying is a beard butter used every day after your shower, and a beard oil applied when you get in from work two or three times a week is great. I've also known guys who use a beard oil every day and use a balm or butter whenever they feel like they need it. As we always say, every beard is different, and it's up to you to experiment and see what your face responds to. You don't already have a beard brush? You really really should. Using a dedicated beard brush should be a standard part of every man's morning routine. See, beard combs and brushes generally have wider teeth than combs designed for your head. This lets them move through the hair easier, as well as getting less tangled. Plus brushing your beard just after you've applied an oil or a balm helps to spread it evenly and prevent your beard from getting clumped. So now you know everything about beard butters. Remember, men, look after your beard, and it will look after you. You know everything you need. Now get out there and grow a beard the envy of every man who sees it. If you've got any questions, feel free to leave a comment, and good luck! Check out our our complete list of the best beard butters. We've attempted to answer all the questions we've been asked over the years, however if you've got a question that you want answering, please ask it below or contact us diectly via our contact form here.